Gourmet dog biscuits made from scratch using naturally healthy ingredients, with care. Stop in or browse online to see our wide selection of healthy gourmet dog treats. We also package and ship dog biscuit orders to any destination in the United States! Order today and find out why young puppies and old dogs enjoy these healthy dog treats and bark for more! "We guarantee that Woofables gourmet dog biscuits are made from scratch, using naturally healthy ingredients, with care. Indulge, and BONE Appetit!" 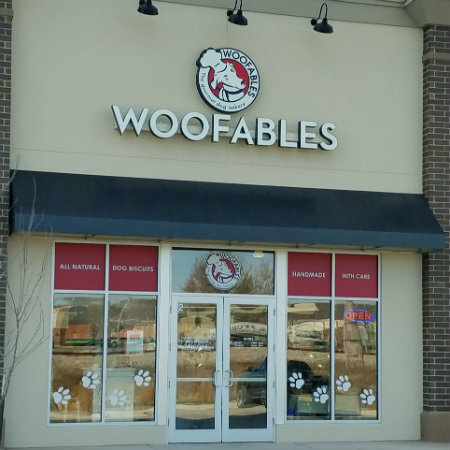 We want you to enjoy great service at Woofables. If you have any questions, comments, or concerns, please let us know! We're here for you (and your dogs)!